Group: Literary Archives | Patchogue Arts Council, Inc.
1:30 – 3:00 PM | Join us at the Patchogue Theatre for music, poetry, and performance. Special performances by Alexa Dexa, Robert Stenzel as Voltar, C.A. Nicola as Capricieux, Michael Krasowitz, & Wendi Weng. 3:00 – 4:00 PM | Line up and promenade with us from the theatre, along Main Street, down Roe Walkway and the Pathway to the Arts. 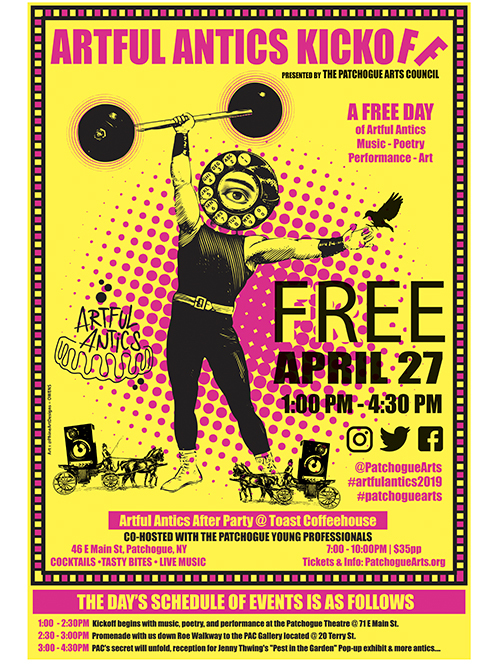 After a ribbon cutting to celebrate the newly installed public art we will end the day at the Patchogue Arts Council Gallery on 20 Terry Street.Costumes encouraged. 4:00 – 5:30 PM | The reveal of PAC’s big “secret” and artist reception for a special pop-up exhibition Pest in the Garden by Jenny Thwing. Hey, wait a minute! I don’t need to go to the city anymore for art! The arts are POPPIN’ right here on Long Island, and I can enjoy art created by world-renowned artists right in my own backyard. 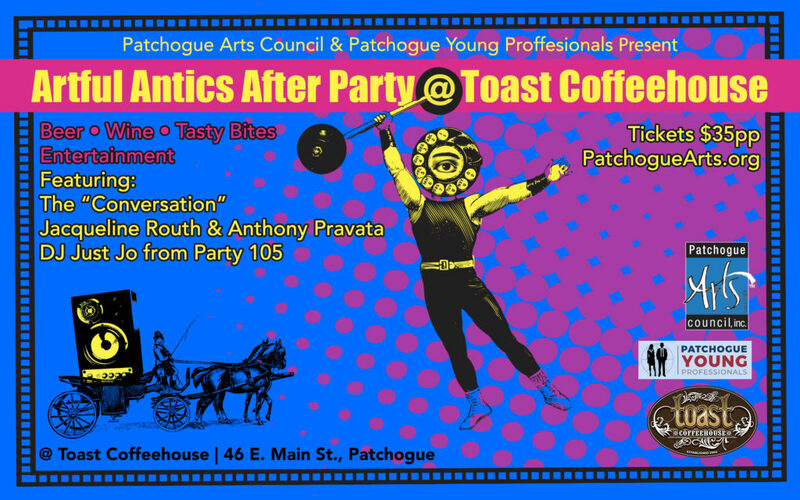 Throughout the year you have the opportunity to experience major arts events presented by the Patchogue Arts Council (PAC) that feature visual arts, music, literature, and performance works, right here on Long Island. The best part is you get to skip the cost of a museum and train ticket. What’s not to love about that? Please consider making a year-end gift to PAC to ensure the arts keep POPPIN’ on Long Island. Consider giving $10 for the ten years of outstanding programming in the arts we’ve provided. However, a donation of $100, $200, or even $500 would have a significant and lasting impact. A donation of $1000? Well, WOAH! We can’t contain the POPPIN’ arts at that level! In all seriousness, we graciously accept and appreciate a donation of any dollar amount. PAC continues to operate with minimal staff considering the breadth of what we present each year. The overwhelming majority of the hundreds of hours of work involved in each program is volunteer driven. Heck, you already know that! You’ve most likely volunteered for something! Almost all of your contribution goes toward keeping the programs POPPIN’ – from keeping the lights on in the gallery to marketing and advertising initiatives, installation expenses, enabling artists to submit for exhibition opportunities for free, and paying participating artists for their contributions. I ask myself daily, “What does having access to PAC’s programs mean to the thousands of people we serve annually?” Well, it means something as uniquely different to each person, as there are various artists of the POP art era. Our programming enables individuals to come together as a community with the opportunity for collaborative creative thinking and developing empathy and tolerance. Art challenges opinions and preconceptions by taking the artists’ experience and transcending it to the world of you and I. 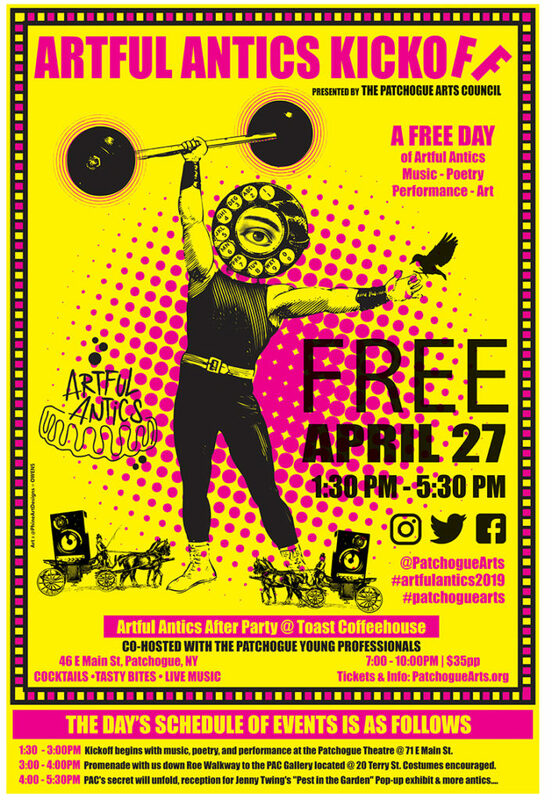 Walking around Patchogue, you have the opportunity to enjoy the Annual Sculpture Exhibition in the Patchogue Community Garden and the thematically changing mural that mirrors PAC’s annual festival theme. This enables you to expand your visual world as you view year-round ambitious exhibition programs in our gallery. Richard Smith, Bob Carter, Mel Pekarsky, Faith Ringgold, Howardena Pindell, Aminah Robinson, and Emma Amos are just a few of the world-renowned artists you’ve been able to enjoy on our gallery walls. We will continue creating imPACtful exhibitions and cultural experiences for the community with your help! For artists, access to PAC’s programming means substantial opportunity for professional advancement. Artists are often expected to provide the world with their gifts for free. At PAC, we believe in being a part of the solution to this problem. This is why we work tirelessly to create no-cost opportunities for artists to exhibit and grow. Our Satellite Galleries at the Patchogue Theatre for the Performing Arts and Roast Coffee and Tea Trading Company accept rolling open submissions from artists to exhibit with no fee attached. We provide artists and groups a platform to demonstrate, and a chance to sell their work at Arts on Terry Contemporary Art Fair with no commission on the sales. In 2019, we will feature a space for PAC members in a dedicated PAC Members Tent. Your contribution allows us to have free rolling submissions and enables us to provide artists that participate in certain PAC events and exhibitions with monetary stipends. For kids and teens, PAC exhibitions and events afford our youth a chance to participate in creative outlets, which provides a space to develop cultural awareness, critical thinking, and language skills. When a child doesn’t understand something, they ask questions. And lots of them! Investigation leads to improved academic performance. Your contribution will help fund our newest community endeavor, a school of the arts launching in 2019 featuring classes and workshops in visual, literary, musical, liberal, and performance arts. PAC’s events, lectures, and screenings encourage us to listen, look, and experience. This challenges each of us to express empathy and be open to thoughts and views unlike our own. Art makes us feel. Your contribution helps keep our distinguished history of inclusion of increasingly diverse artists, cultural aesthetics, and innovation alive. 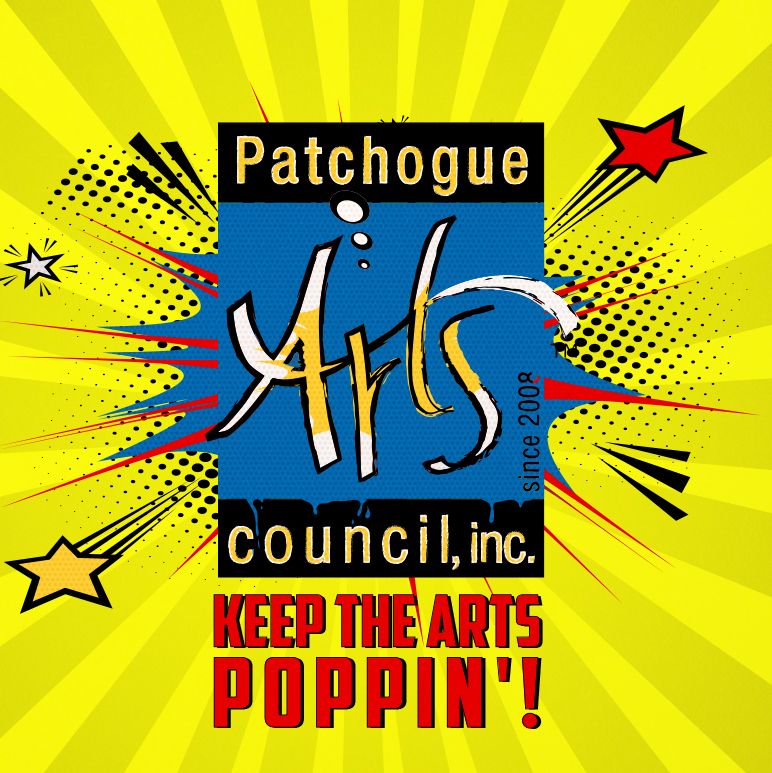 The Patchogue Arts Council is mindful of our responsibility as a community resource. For this reason, we take great care to ensure all people, regardless of economic status and residence can enjoy our exhibitions and events. Most of our activities are free, and the few lectures and screenings with fees are minimal. Your donation enables us to keep our events available to the Long Island community at large. Above all, the arts create happiness. We all could use more joy in our day to day lives, and your contribution does just that. Your support enables the Patchogue Arts Council to present pleasurable moments in time, for reflection, experience, and enjoyment. In Spring 2019 PAC has something amazing to reveal. It’s a secret… a grand secret. I can tell you this, it will POP the arts on Long Island in a way never before seen, and you will want to be a part of it! We appreciate your donation, at any level. If you donate now, we will add you to our exclusive top secret 2019 unveiling newsletter list, and you will be the first to know more about this super art POPPIN’ secret! You will also receive a PAC Keeps the Arts Poppin’ car decal to represent your commitment to the Long Island art scene. A donation of $75 or more will also get you a Kidrobot Andy Warhol Brillo Object Blind Box! 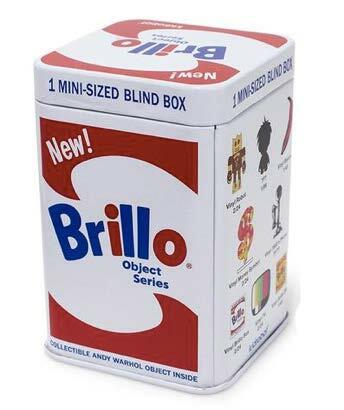 Warhol created his controversial Brillo Box series because he “wanted to make something ordinary.” Kidrobot and the Andy Warhol Foundation present these miniature tin Brillo boxes, each containing an art object celebrating Andy Warhol. Stop by the Patchogue Arts Gallery to pick yours up with a $75 donation. $100 or more, we’ll drop your Kidrobot Andy Warhol Brillo Object Blind Box in the mail to you, and throw in one ticket to our POPPIN’ Arts Long Island Party taking place in January 2019.$500 and up, POP to the party as a VIP with a guest! So please consider supporting the arts today. Your support allows PAC to keep the arts POPPIN’ on Long Island by providing arts and culture to the community at the highest caliber possible. We appreciate any and all contributions that are made, and most importantly, we appreciate you. PS… PAC’s 2019 secret is hard to contain… it’s POPPIN’ at the seams! Your contribution today will get us one step closer to this extraordinary POPPIN’ surprise! So use the envelope, write a check or visit our site to donate via PayPal, and please give generously now. We are grateful for any amount.